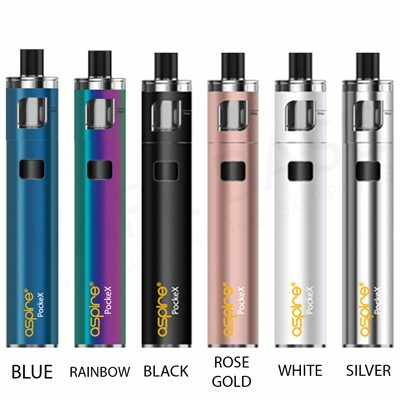 Best known as an all-in-one starter kit, the Aspire PockeX exhibits compact features yet it utilizes the vape tank and a 1500mAh battery both integrated into a single unit. The unit can easily be disassembled to enable easy cleaning. This starter kit portrays the shape of a pen to provide the best stealth vaping. The compactness makes it ideal to carry around (in the pocket, bag or in your hands), to use while on the move. The Aspire Company looks to growing each day with the starter kits production which means that the quality used in the making of its starter kits is top-notch to provide better vaping experience. The construction of the exterior part of the Aspire PockeX Kit is made purely of stainless steel that gives it the perfect smooth-almost-silk finish. With the 1500mAh integrated battery, you get long hours, even days, of using the starter kit non-stop. The tank has a capacity of 2ml and can be easily refilled. It features one fire button that when clicked five times, it powers on with a blue LED flash and the same number of clicks are used to put it off and lights up pink. When it lights up a blue LED flash, you know that the battery percentage is above 30 and when lower than 30% the power button glows with pink LED light. The kit is made leak-proof to ensure no mess left after replacing the coil. I love Aspire PockeX Kit. It produces the best taste. Build quality is wonderful. Great price. For me, it this the best kit in this price range. It works better than my expectations. Coils are also great. One of the best pen style vaping kits for everyday use. Quality is really top notch. Price is set within the affordable range. The performance of this kit is super smooth. There are no issues in this product. Recommended. This is my favorite vape kit since the day I bought it. Awesome quality and performance.